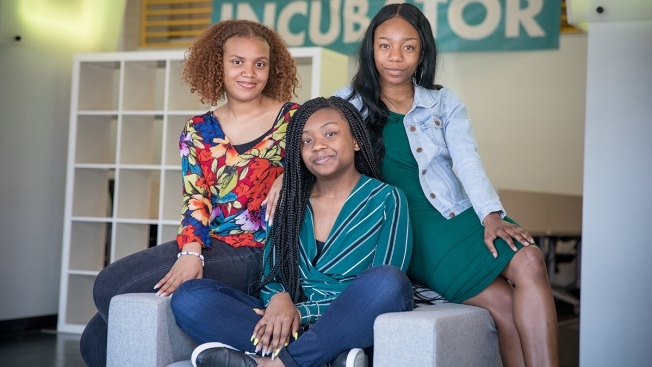 India Skinner (left), Mikayla Sharrieff and Bria Snell, 11th graders from Banneker High School in Washington, DC, are finalists in a NASA youth science competition. They are the only team of all-black students. Their successes have been getting a lot of attention among black figures on social media. Three black Washington, D.C., students who faced racist comments when they used social media to encourage voting for them in a NASA competition have been awarded $4,000. Mayor Muriel Bowser's administration announced Thursday that it would award the money to the Banneker High School team. The grant will help Mikayla Sharrieff, India Skinner and Bria Snell build on their project to design a system to remove lead from drinking water in schools. Their work landed them in the science competition's final stage. Users of the anonymous online forum 4chan subjected the team to racist comments. The 4chan posters recommended computer programs that would hack the voting system, prompting NASA to shut down voting early. NASA expects to name the competition winners this month. The Washington Post first reported this story.